Variable Speed electric hoist with lifting capacities up to 2500kg. A fully featured hoist as standard which is easy to use and maintain. Reliable, versatile, fast and efficient, the choice of many professionals. 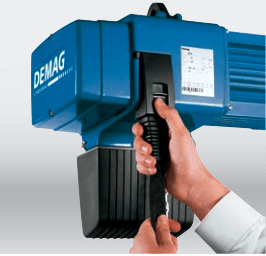 The Demag DCS Pro is an electric hoist which is capable of lifting loads up to 3500kg. 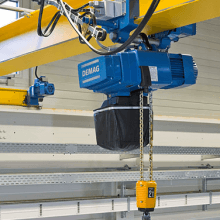 This highly efficient and reliable, fully featured chain hoist boasts variable lifting speeds as opposed to 1 or 2 speeds like the other DC hoists. This is an extremely versatile electric hoist with various options available, including standard or radio controls. 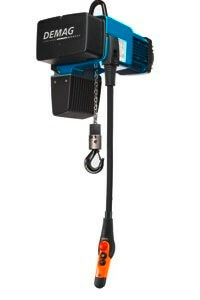 This all inclusive electric hoist boasts improved safety, reduced wear and therefore a longer working life span. The variable speed control of this hoist enables sensitive movements for precision lifting, whilst also offering higher efficiency and safety throughout the lifting application. The simple control pendant works the variable speed akin to a cars accelerator. Gentle pressure on the button will move the hoist’s pendant slowly. With increasing pressure the pendant will move quicker and lift faster. Reduce the pressure again and the load will slow down. This hoist is a true variable speed electric hoist and is perfect for lifting loads where extreme precision is needed. The variable speed is available across the complete load range and has a creep speed from just 0.04 m/min, which is of great benefit at the start and end of the lifting process. The control ratio is 1:100 which enables both precise positioning and faster lifting speeds. The pro-hub function enables nominal speeds of up to 90% for partial or no loads. 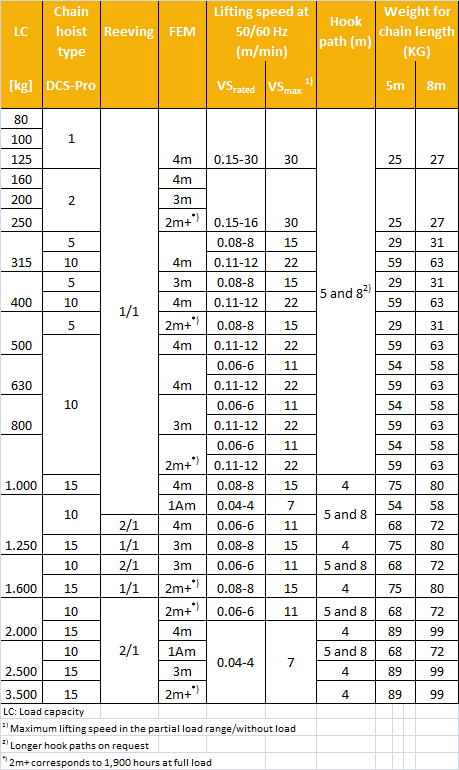 Before the limit switch locations are reached there is an automatic switch to a creeping lift speed. 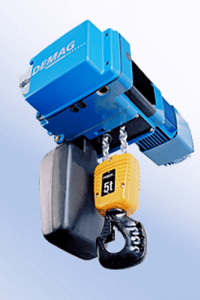 If you want Fast, safe, precise and reliable lifting then the Demag DCS Pro chain hoist is the perfect choice. The simple and ergonomic design allows easy servicing and simple, easy access plug in connections with no extra wiring necessary. An easy access pivotal cover provides quick access to connection sockets, pendant height adjustment and chain lubrication. The chain drive is easy to change without needing to remove other parts. The speed monitored slip clutch provides the overload protection. Together with the gearbox and brake they have a maintenance free period of up to ten years. 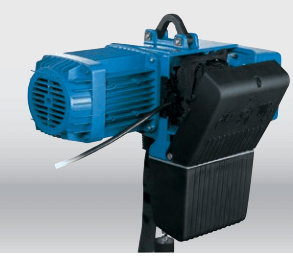 The slip clutch mechanism eliminates continuous slipping which can be damaging. Because the brake is situated in front of the slip clutch in the load bearing configuration the load will always be held in any situation and will not drop when the hoist is stationary. This hoist has a cylindrical rotor motor which incorporates a fan and a magnetic brake which is separate; this design optimises the hoists high strength qualities. The hoist can be reliably operated within temperature ranges of -20 to +45 degrees centigrade without any duty factor reductions, operating in temperatures up to 60 degrees and more is possible depending on circumstances. The impact resistant chain collector has an articulated attachment for ease of use and keeps the excess chain out of harm’s way. Other types of chain collectors are available, please enquire. Other safety features include ramps for breaking and acceleration to help reduce swaying of the loads these can be modified via the control unit; monitoring of the motor temperature reduces the chance of overheating. Also incorporated into the hoist is a counter for elapsed time operation and a diagnosis interface. 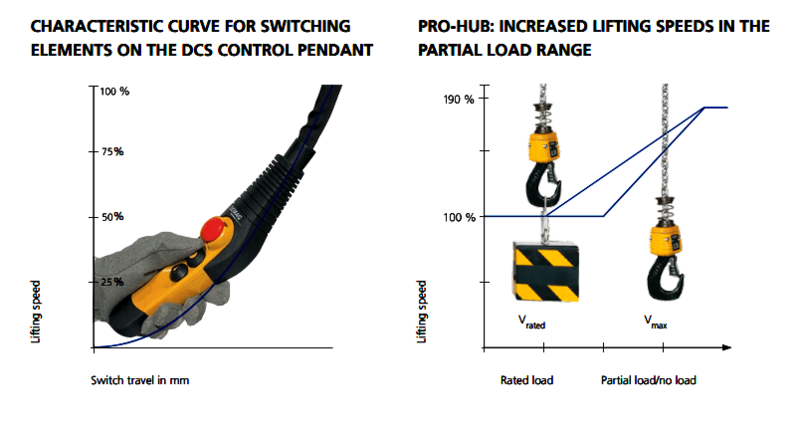 The 24v control and limit switches also serve to add to the safety of the Demag DCS Pro. 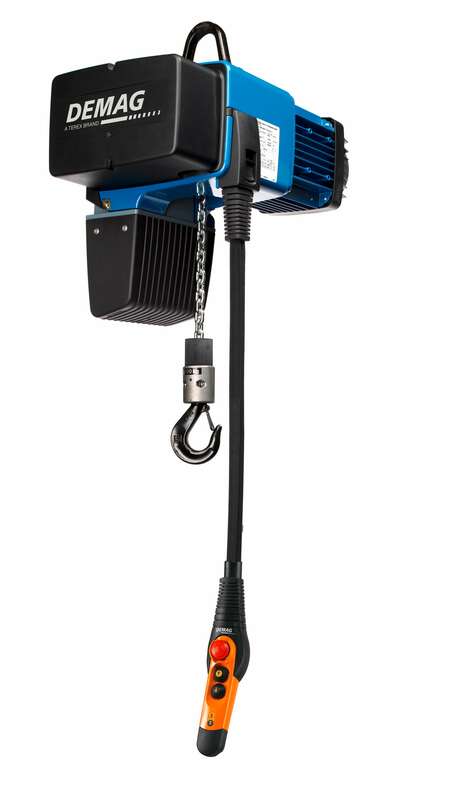 This hoist also boasts a wide voltage input range 380-480 V/50-60Hz. There is no sinking of the load thanks to the excellent brake / coupling systems. 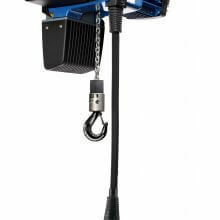 The DCS Pro electric hoist can be operated by a choice of pendant controllers; these can be of the standard variety of the radio control variety. The range of pendants to choose from are all ergonomically designed with a gentle curve for comfortable use and are suitable for left and right handed users. They are all IP55 protected against dust and moisture ingress. The innovative control cables allow simple adjustment of the length and pendant position. Radio controlled pendants offer greater flexibility and are easy to connect. There are a few different designs to choose from, including a joystick model which are suitable for specific models, so please enquire prior to ordering. 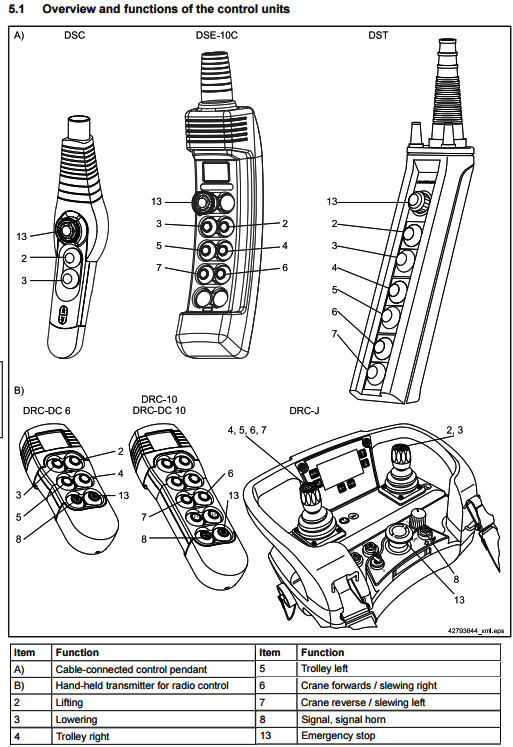 The transmission of the radio control system is reliable as it uses frequency hopping with automatic management. They can be fast charged or can use conventional AA Mignon batteries. The radio wave frequency does not require registration or extra operator fees.